Canadian Natural Resources reported a big third quarter miss today as low oil prices and lower production dragged earnings further into the red. Despite the loss, the company remains focused on growing production and strengthening its balance sheet. Production at Horizon was cut in half to 67,586 bbl/day in the third quarter due to coker maintenance and shutdowns required to complete tie-ins for its latest phase of expansion. Phase 2B started up in October, bringing production to 175,000 bbl/day of upgraded Synthetic Crude Oil (SCO). The company expects Horizon to reach in excess of 182,000 bbl/day SCO in the fourth quarter. SCO production was sold at $58.61/bbl in Q3, down 3% from last year. However, transportation costs almost doubled to $3.40/bbl. The sharp increase was due to lower sales volumes. Operating costs at Horizon were reported at $27.05/bbl SCO (including natural gas costs), unchanged from last year. Natural gas costs were $2.13/bbl, up sharply from the previous quarter. For the full year, Horizon is expected to produce between 120,000 and 132,00 bbl/day of SCO. Another $1 billion will be allocated towards the completion of Phase 3, which will add another 80,000 bbl/day of production by the end of next year. This last phase of expansion includes the addition of a new ore preparation plant, two extraction trains, combined hydrotreater and sulphur recovery unit. Once completed, Horizon's capacity will be over 250,000 bbl/day with estimated operating costs of $25/bbl of SCO. Phase 3 was reported at 87% complete by the end of Q3. Production from the company's thermal in-situ operations (including Primrose, Wolf Lake and Kirby South) averaged 103,481 bbl/day in Q3, down 22% from the same time last year. Production declines were blamed on maintenance activities at Primrose and production variations that naturally occur during Cyclic Steam Stimulation (CSS). Q4 production is expected to increase to a range of 127,000 to 133,000 bbl/day. Total annual production is expected to be in the range of 110,000 to 130,000 bbl/day. Kirby South production averaged 38,150 bbl/day. Operating costs declined to $8.86/bbl, down 18% from Q3/2015 but up 4% from the previous quarter due to higher fuel costs. The facility's steam-to-oil ratio (SOR) averaged 2.6 in the third quarter. The company also announced it will be restarting engineering and procurement activities for Kirby North, with a focus on reducing construction costs. The project will add another 40,000 bbl/day of heavy oil production. If all goes according to plan, first steam is expected in 2019 with first oil projected for 2020. 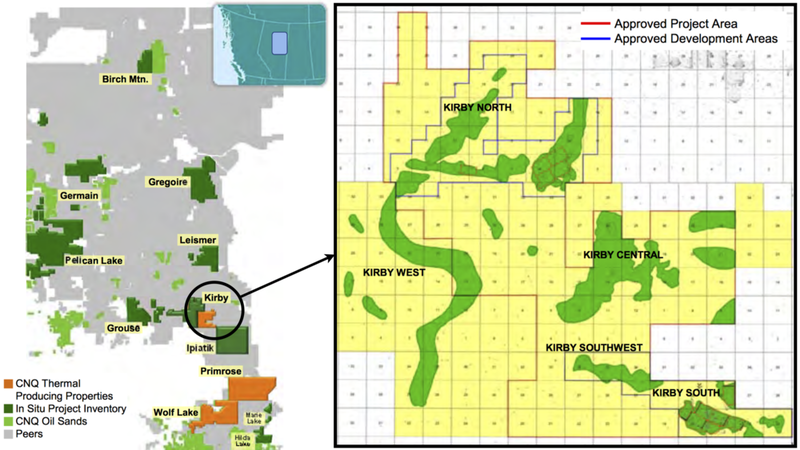 Kirby North will use the SAGD process (Steam-Assisted Gravity Drainage), much like its Kirby South operation. About $700 million in capital was already invested in the project before it was shelved. An additional $650 million remains to be spent, which is $100 million lower than the original estimate. Net losses in Q3 widened to $326 million versus $111 million for the prior year. Cash flow from operations rose to $1.0 billion. Total oil and natural gas production also declined 13.4% to 735,212 boe/day in Q3, which was within its guidance range. CNRL is the biggest contributor to Western Canadian Select, adding 191,000 bbl/day of heavy crude to the stream in Q3, representing 47% of total volumes. Despite the earnings miss, the company boosted its quarterly dividend by $0.02 (roughly 9%) to $0.25 per share. Nov 2 Ministerial Panel on TransMountain Expansion concludes pipelines are "controversial"